Jane Lombard Gallery is pleased to present Lucy + Jorge Orta's exhibition Potential Architecture. 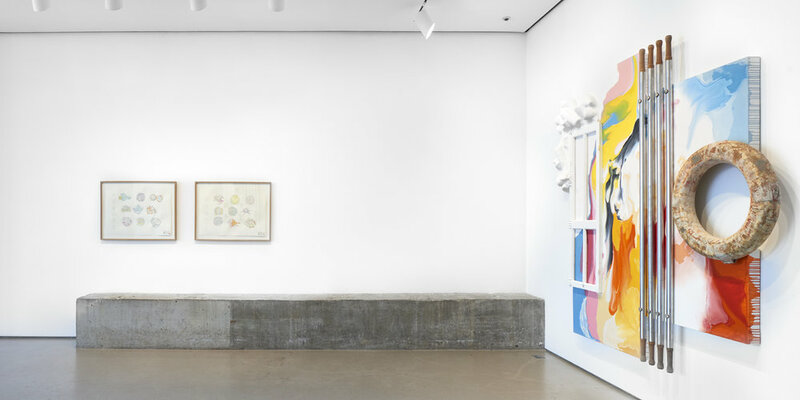 Featuring work from their series Derrame, Totipotent Architecture, and Cells [Diptych], including painting, sculpture, and works on paper. As an international duo, Lucy + Jorge Orta's symbiotic practice examines social and ecological issues across the globe, this exhibition analyzes how the architectures of the human body and inorganic materials interact with internal and external structures. Totipotent Architecture is aligned with Lucy + Jorge Orta's emphasis on universal concerns surrounding shelter and security in their practice. A totipotent cell has an unlimited capability to create new life either organically or synthetically. Totipotent Architecture expands on the concept of body architecture, looking inwards at the cellular level. The Orta’s creative process stemmed from a fascination with cell biology and differentiation. Through drawing, modeling and glass blowing the artists transfigure the journey of expansion of the uni-cell. The cell creates new points of habituation, drawing from the architectonic potential of existing structures. The blown glass orbs exist in the delicate balance of their constructed homes. The Ortas were fascinated by the molecular mechanisms of the conserved cytoskeletal process. They studied the cellular interaction in chromosome mis-sequencing, which produces intricate three-dimensional structures. 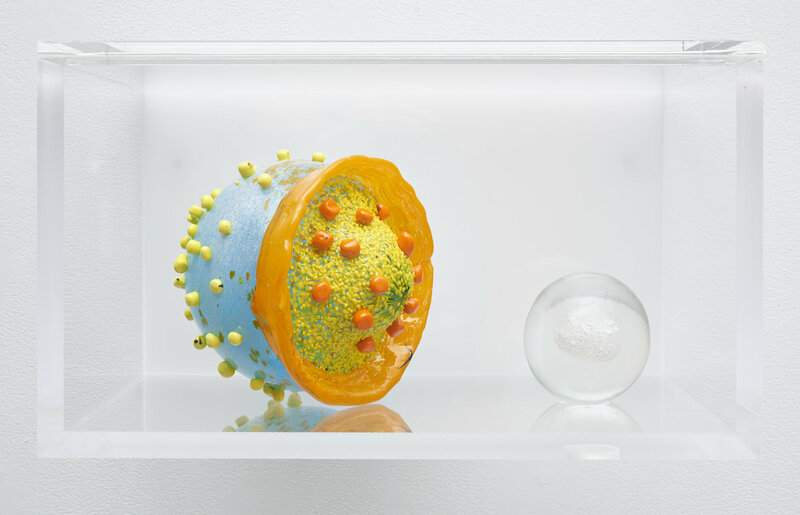 Lucy and Jorge Orta depict these complex units in their Cells [Diptych] series; including a collection of watercolors and hand-blown glass sculptures offering a singular interpretation of the different stages mitosis and meiosis. The watercolor works on paper dissect the beauty and intricacy of the process and accompany the Cell [Diptychs]. Their individual shapes and density are an homage to the complexity of cells. The Derrame [Accident] 1977 originates from Jorge Orta’s life in Rosaria, Argentina from 1972 - 1984, under a dictatorship. La Guerra Sucia (“The Dirty War”) was a period of terrorism and repression, Jorge Orta imagined the gestural works as an act of ‘anti- painting’ in this climate of chaos. The title is derived from the Spanish word ‘derrame’ and it’s malleable meaning an outpouring, spill, leak, escape, loss, all are poignant descriptors for the distinctive pigments flowing across the canvas. Lucy Orta (b. Sutton Coldfield, UK, 1966) and Jorge Orta (b. Rosario, Argentina, 1953) have exhibited at the 46th Venice Biennale International Art Exhibition, Italy (1995); Johannesburg Biennale, South Africa (1997); The Curve gallery, Barbican Art Centre, London, UK and Fondazione Bevilacqua La Masa, Venice Biennale, Italy (2005); Museum Boijmans Van Beuningen, Rotterdam, Holland (2006); Biennial of the End of the World, Ushuaia and the Antarctic Peninsula (2007); Pirelli Hangar Bicocca, Milan, Italy (2008); Natural History Museum, London, UK (2010); MAXXI National Museum of XXI Century Arts, Rome, Italy and Shanghai Biennale, China (2012); Yorkshire Sculpture Park, UK (2013); Herbert F. Johnson Museum of Art, USA and Parc de la Villette, Paris, France (2014); London Museum Ontario, Canada (2015); Attenborough Arts Centre, Leicester and City Gallery and Museum, Peterborough, UK (2016); Les Abbatoirs, France (2016); Frieze Projects London and Centro Cultural Kirchner, Argentina (2017); Ikon Gallery, United Kingdom, Vitra Design Museum, Germany, and The National Museum of Women in the Arts, Washington D.C., USA (2018); De La Warr Pavilion, United Kingdom (2019).